I haven’t shared many of my photographs over the past several months. In part, this is because I’ve been too busy to photograph — a situation I’m going to try to avoid in the future. You’ll start seeing more of my photographs after mid-April and beyond, but in the meantime, here’s one from last spring. There have been a couple other Narcissus photographs on BPotD previously: Narcissus bulbocodium and Narcissus pseudonarcissus subsp. munozii-garmendiae. This photograph was an attempt with sunset backlighting. 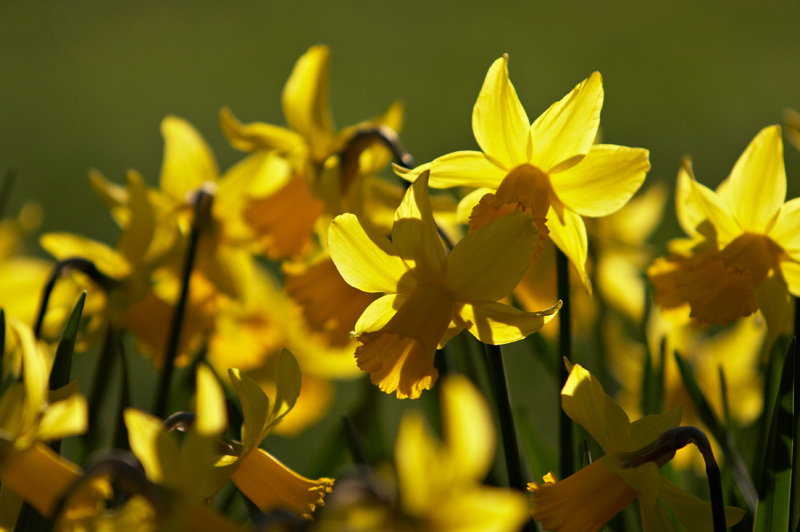 It is difficult to find much about this particular variety of daffodil online, though it is recognized botanically by the Royal Horticultural Society in The International Daffodil Register. In the garden’s accessions database, we list it as being native to Spain. Any sign of spring, after the brutal winter, that is still lingering here in Southern Ontario, is very welcomed. How hard is it to trace some of these ubiquitous garden plants back to their wild origins? I see an accession number on yours – what do you know about the origins of this plant? A very welcome photograph as there is still snow on the ground around here. The light makes the pedals look very delicate. Eric, this plant is traceable by its unique 3-digit sequence to Wuppertal Botanic Garden in Germany. Beyond that, it would be necessary to contact the institution to find more information in this case. Recently, I’ve begun choosing Narcissus (and other) seeds that are accompanied by collection documentation about their wild origins. When we collect wild seed, we strive to provide precise details including latitude/longitude coordinates and habitat information. Sorry, Eric, 4-digit. As in, “0352” in this case. Brent – thanks for the info.